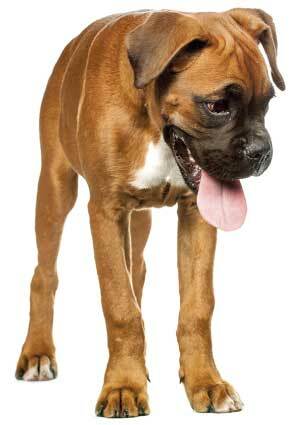 Northside Veterinary Centre has just turned two! This was us on March 3rd 2014, the day Peter Burgess handed over his keys. Peter had big shoes to fill – it took two of us to take on his business. It’s been a busy two years. Thank-you for being patient with us, while we’ve modernised the clinic, and tried our best to keep your pets happy and healthy. First we changed over to a consultation schedule and gave the garden and building some TLC. 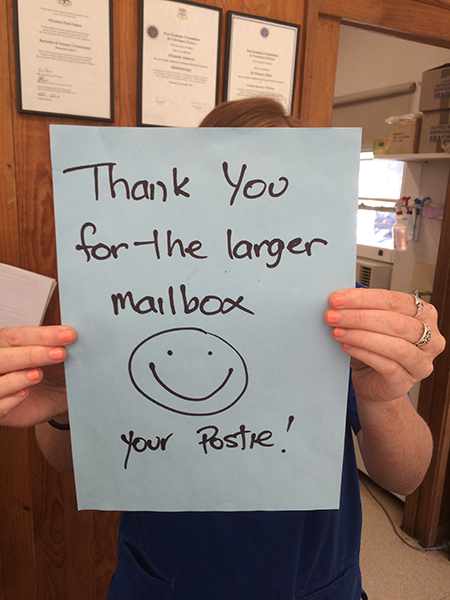 Our postie was happy about the change. Next we installed a computer system. 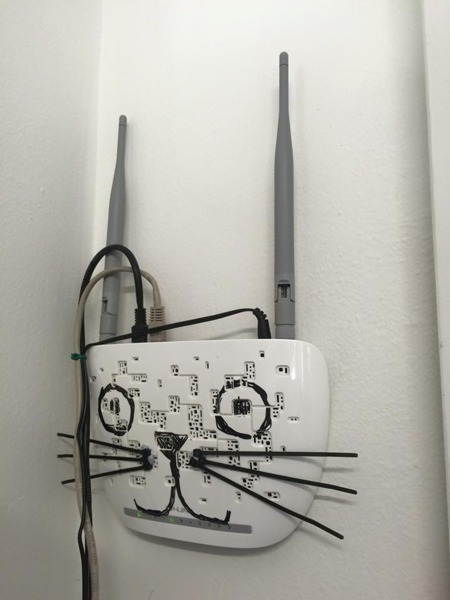 The wi-fi needed a facelift for the luddites amongst us to learn to love and attend to her at times of need, and thus was transformed to Wiffy, the clinic cat. The first few months were pretty exciting. 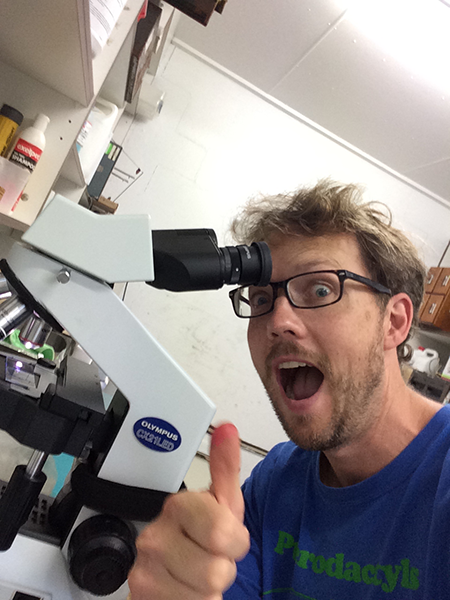 This was Winston when our new microscope arrived – we’d been hoarding a collection of cytology slides in the linen cupboard to review. 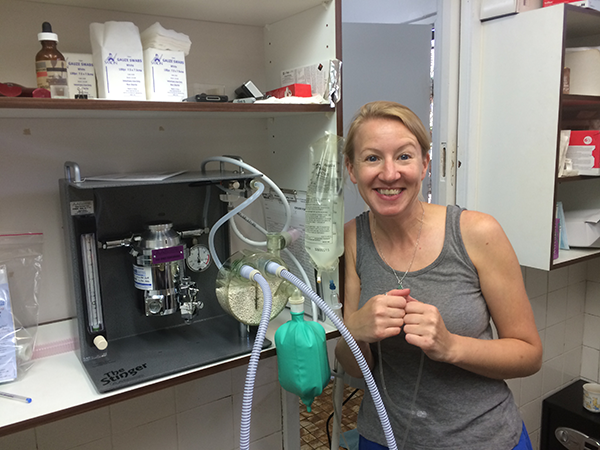 This was Caroline when our new anaesthesia machine arrived, allowing us to update to more modern anaesthetic regimes. A dental radiography system arrived early, to allow us to proceed with appropriate dental care. When over 50% of cats and dogs teeth are tooth roots unable to be seen without radiography, dental care without x -rays is guesswork. Radiography allows us to make good decisions and treat any painful teeth appropriately. Dental radiography also allows Winston to do more specialised procedures , such as root canals and tooth capping, which allow salvage of damaged teeth rather than always proceeding to extraction. Digital radiography for chest, abdominal and musculoskeletal radiography arrived shortly after. Compared to the traditional film radiography, digital radiography provides a more detailed image than can be enhanced and magnified easily. It removes the need to keep developing chemicals, a health risk for the environment and the staff, and usually allows us to take a radiographic series more quickly. It also allows us to give you a disc of your pet’s radiographs if you wish, and send x-rays to other vet clinics quickly. 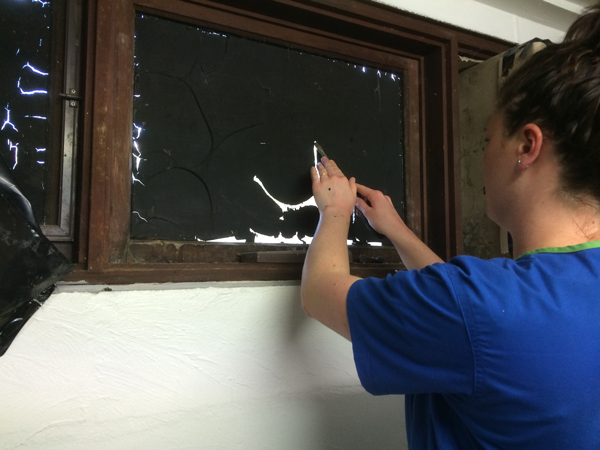 The animal ward needed to be absolutely light proof to develop the film radiographs – a digital update allowed us to bring light into the animal ward. Our ultrasound machine was next, which we find an invaluable diagnostic tool. This allows us to assess abdominal disease in a non-invasive fashion, and in some cases to collect cytology samples for pathology. 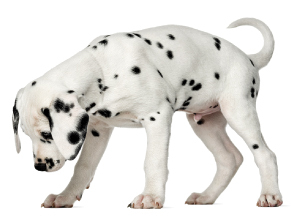 Without using an ultrasound, many of these animals would need an exploratory surgery to examine their abdominal organs, considerably more expensive and invasive. The ultrasound is also a great tool for investigation of heart disease. Other pieces of equipment have included a Tonopen (to measure the pressure of the eye), blood pressure monitors (used on every anaesthetic to improve patient monitoring), a BAIR Hugger (a hot air blanket to keep patients warm), intravenous fluid pumps (to control the flow of intravenous fluids exactly) and blood test machines. The clinic has become busier. Winston and Libby still work 4 days a week in the clinic. However, as time is split between doing surgery and other day procedures, and consultations, they aren’t always available for consultations every day. We now have several vets helping us within the clinic. Always feel you can ask the receptionist if you can see a specific vet, and wherever possible, they’ll try to schedule your appointment appropriately. We work as a team – if your pet is in hospital with us, or has an ongoing condition, we discuss the case. We strongly feel combined knowledge and skills make us better clinicians, and we all have our specific interests with more in-depth knowledge. 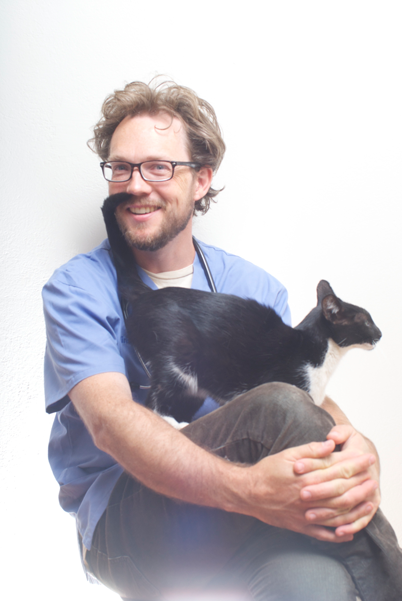 Winston grew up in Canberra, and has over 15 years experience as a small animal general practitioner. 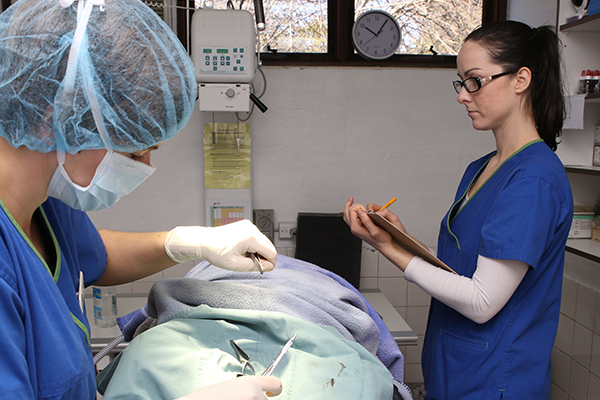 He has done further study and obtained Membership of the Australian Veterinary College in both small animal medicine and veterinary dentistry. He has exceptional skills in ultrasonography and dentistry. He juggles his time at NVC with his wife and four children and a large menagerie of 1 Labrador, 2 Oriental cats, 3 guinea pigs, 1 bearded dragon and several chickens. Dr Libby Adamson grew up on a cattle and sheep farm in Victoria, and has over 20 years experience as a general practitioner. She has done further study and obtained Membership of the Australian Veterinary College in feline medicine, and completed further study in ophthalmology, and attended several courses on animal behaviour. She spent 5 years working in the UK and has volunteered in central Australia, Sri Lanka and Morocco. Outside the clinic, she is a keen cyclist and has a boxer cross named Cisco, who is now greying and sensible, but wasn’t always, and loves cats too. Dr Alexandra Novitski (Sasha) joined us within 6 months as a full time clinician. Sasha grew up in Canberra, but then left to study at University of Queensland, and spent several years working in Queensland and the UK. She has worked in emergency practice in the Gold Coast and treated more cases of tick paralysis than the rest of us combined. 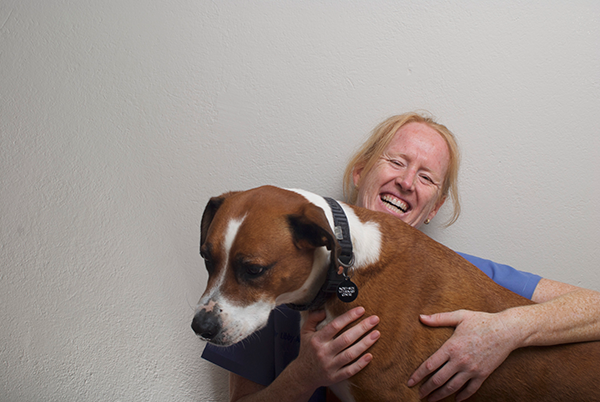 Her main interest is small animal medicine, specifically ultrasonography and anaesthesia / analgesia. She loves to travel, but is also enjoying being home in Canberra and able to spend time with family and friends. Dr Penny Baker-Gabb started helping us out on Mondays just a few months after we started. She continues to work on Mondays, and works additional shifts when others are on holidays. Penny is Canberra born and bred, graduated with Winston from Sydney University, and has worked locally besides brief stints in Samoa and Sydney. 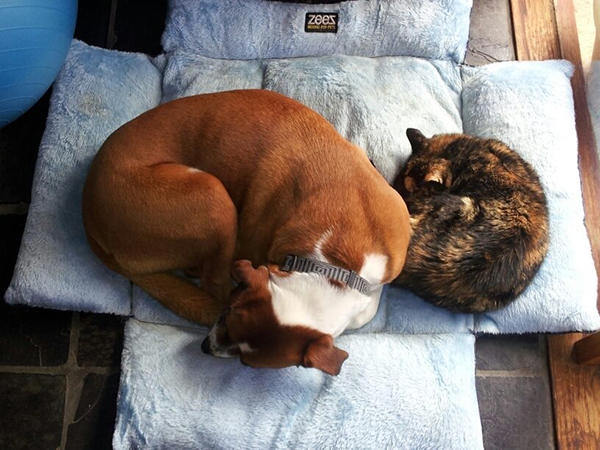 She shares her home with a snuggly and demanding Devon Rex cat and two guinea pigs. When not working she wrangles her two young kids with her husband, and dabbles in pottery. Dr Gail Garrison has been working with us since July 2015, and is currently working on Thursdays and Fridays. Gail is in Australia whilst her husband studies at ANU, and graduated from Michigan State University in 2010. 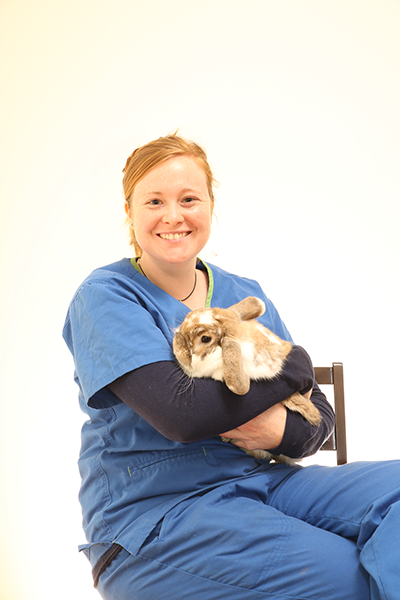 She has worked in small animal and equine practice. 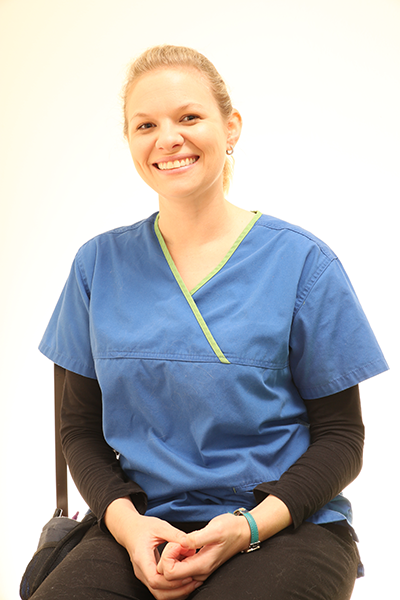 She enjoys soft tissue surgery, and brings to us valuable experience, having used many products licenced in the US that are new or yet to be realised in Australia. Transcontinental experience can be invaluable at recognising different disease patterns and having experience with different treatment regimes. Gail is enjoying exploring as many of Australia’s cities, beaches and mountains as possible with her husband and two children. Their mixed breed dog Freya is now a skilled possum and kangaroo watcher. 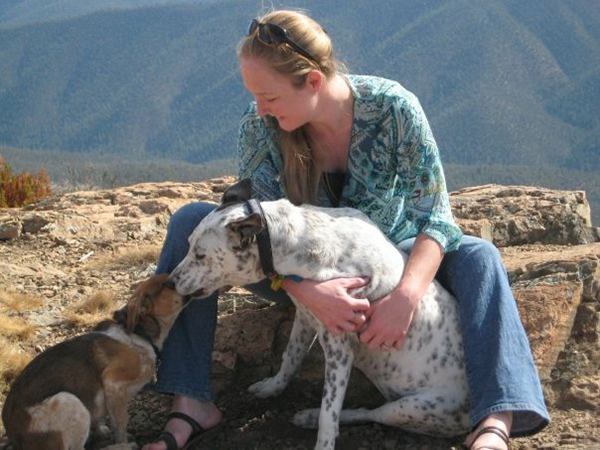 Dr Gillian Lynch graduated from Sydney University with Winston and Penny, and has previously worked with Libby and Winston for many years. Most recently, she has just returned from 3 years in Jakarta. Here she combined some volunteer work in shelters with undertaking her Masters in Veterinary Studies through Murdoch University. Her specific interests are internal medicine, dermatology and behaviour. Gill has 2 children, and is currently working Tuesday and Wednesday with us. 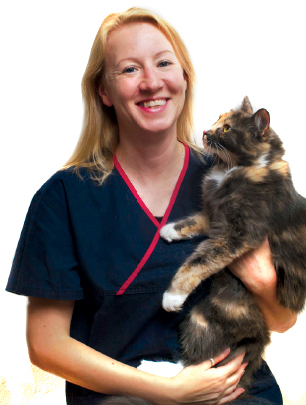 Melissa Dare is a fully qualified veterinary nurse with many years experience, who has worked with Winston, Libby and Caroline previously. She has a soft spot for pugs. Caroline worked as hard as Libby and Winston in the initial few months trying to find NVC’s feet. She has been nursing for over 25 years, and is an invaluable part of the team. Unfortunately, a significant back injury in January 2015 has meant Caroline can no longer nurse. She now works part-time as office manager, and has been enjoying developing her skills in her other part-time job. We miss her capable nursing hands but it’s great to still have her working with the team. Clare Valenzuela had been nursing for Peter for several years, and we were incredibly lucky to have stay on to work part-time with us. 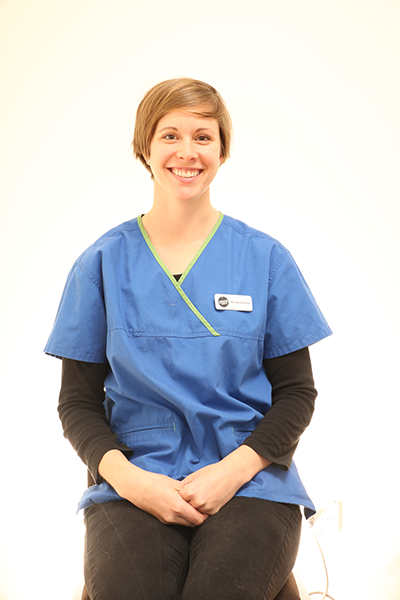 Her knowledge of the clinic is invaluable, and she has enjoyed helping us with the changes to the clinic. 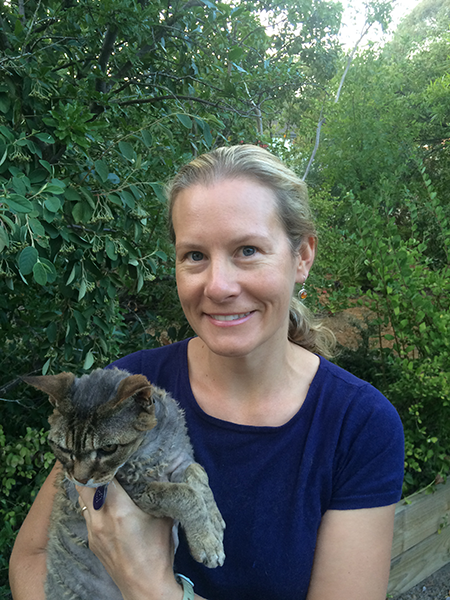 Clare has 2 children, 2 kelpies and 2 cockatiels to keep her bush and somehow she also finds time to study (human) Nursing at the University of Canberra. 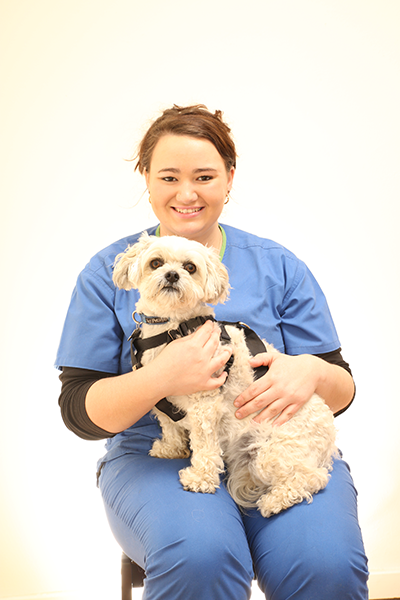 Sarah Taylor is in her final year of veterinary nurse training. She has two beautiful dogs, Winner and Jumbo, and is passionate about animal welfare. 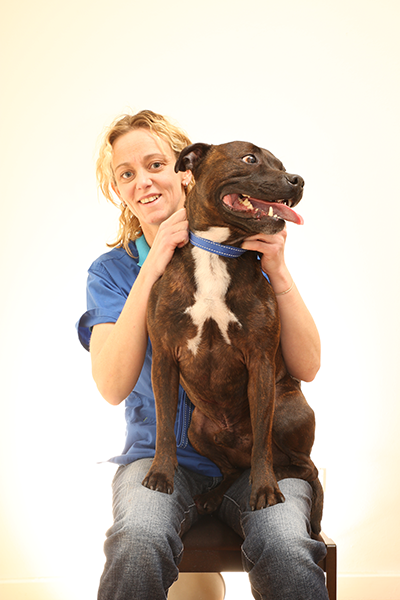 Sarah runs our Puppy Pre-School classes, and is keen to pursue further training in animal behaviour. Maddison Shannon-Hooper (Maddie) is a fully qualified veterinary nurse, and joined the NVC team in 2015. In her words, she “ has loved every moment of it”. She grew up with many different pets, including horses, dogs, a cockatiel, a rabbit, a rescued cat and a rescued talking galah! 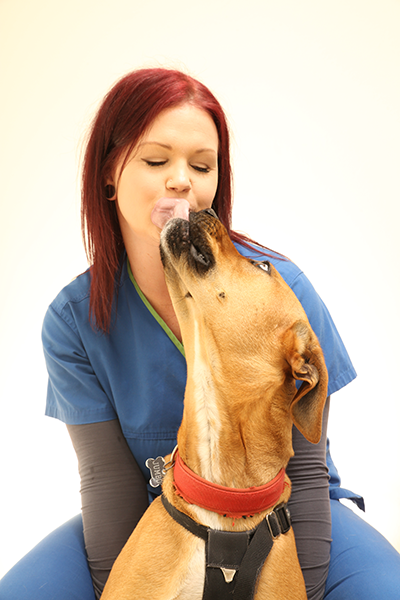 Naomi Treloar has many years experience within the veterinary industry. 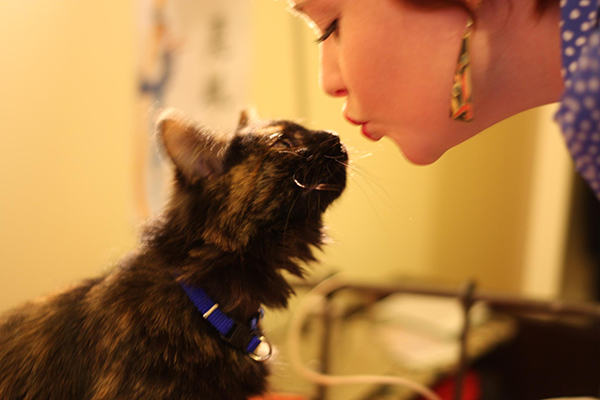 She has a “naughty tortie” cat, Opium. She claims to be a twitcher (dedicated bird watcher), and is an excellent cat whisperer, be it naughty torties or our Wiffy. 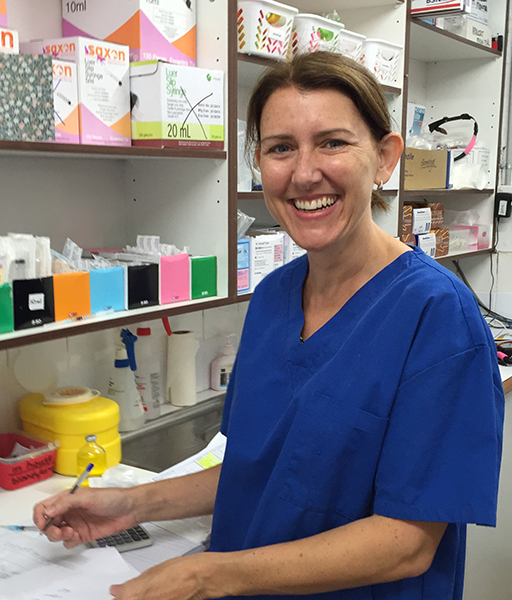 Amanda Josephs is a fully qualified veterinary nurses, and joined the team in 2015 having moved from Boorowa. She has a horse, a cat and a newly adopted mastiff cross puppy to keep her busy. 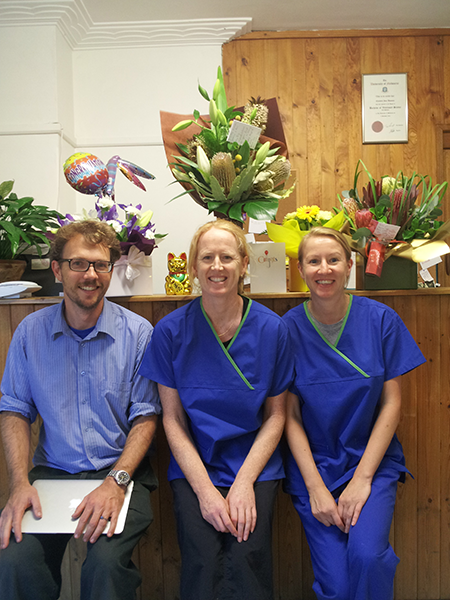 The team at Northside Veterinary Centre.